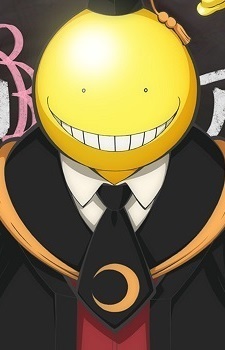 Koro-sensei is a teacher for class 3-E of Kunugigaoka Junior High School and the main antihero of Ansatsu Kyoushitsu. He was responsible for carving out a large chunk of the moon to become a permanent crescent moon and plans to destroy the earth after teaching class 3-E for a year. His name comes from Korosenai (殺せない) means "cannot be killed" and sensei, means teacher. Literally, his name means unkillable teacher.